There are many inconveniences of applying false muntins in architecture. For one, they fall off, often from just one window or even a part of a window, and then the rest of the façade is revealed as nothing but a stage set with cozification instead of real quality as its principle. Secondly, they look very much like prison bars from the inside, hanging outside of the window. Not very nice, especially if you've already been to prison. Thirdly, they cast shadows on the windows that make them even look like prison bars from the outside. Other than that, they're often used when replacing beautiful windows in old houses. Most old windows are built out of excellent materials, and can easily be restored and/or supplemented with new and more energy efficient windows on the inside. Did I mention false muntins are tacky? Well, they're tacky! Ugh. 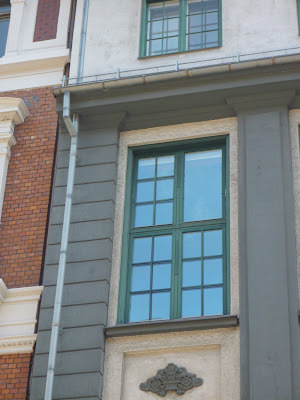 Oh, so you think the fake windows are bad, then check this out. Nooo! That's just so wrong. Probably made out of some plastic material? Do you have an architecture blog as well?